We wanted to make an instrument that was ambient but at the same time had the touch and exactness of a close miked instrument. Using ambient mikes only can lead to a great sound, but as a musician, you might experience a bit of inexactness in the attack. Just blending two signals together didn’t really accomplish what we wanted, so instead we used a combination of different sources, morphing and convoluting techniques that gave us the result we where after. 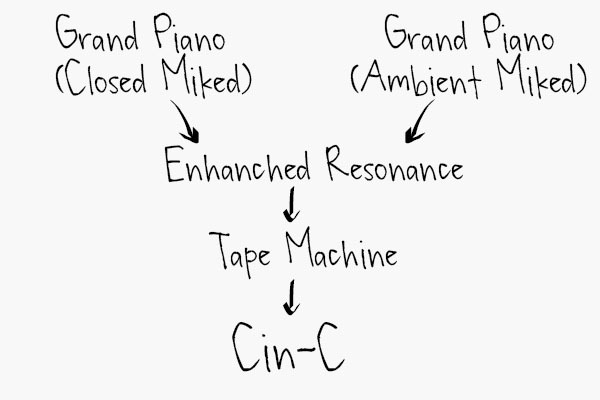 The resonance of a Grand Piano is very interesting! With all the dampers up, (by pressing the sustain pedal), all strings are undamped, so when hitting a note, you will get a very complex variation of sympathetic resonances from the strings and soundboard. We have captured that resonance and enhanced it so this instrument really, really breathes and sings!